Clear History will work on any PC computer with Windows 2000, XP or Windows Vista. There are no particular hardware requirements although the program will likely operate faster on newer systems. 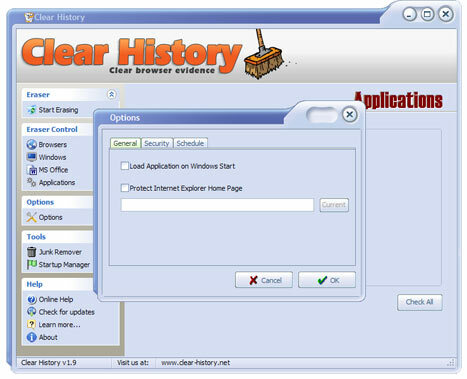 Download Clear History executable (.exe) file here. Double click it to start installation procedure. 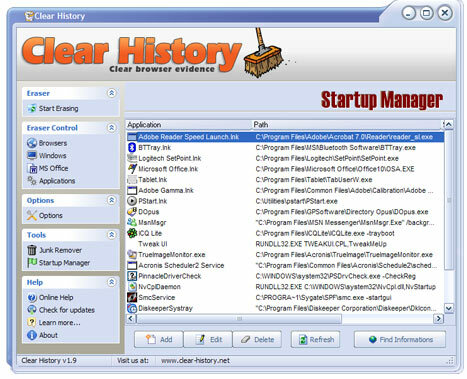 After installation is finished you can start Clear History from Windows Start menu - Programs. Pressing this button will simply start the erasing procedure based on options you defined in Eraser Control menu (see below). Location bar (or address bar) is a place where you type a web address in your browser. A location bar keeps history of websites that you recently typed or pasted into address bar. This option will delete list of all recently accessed web sites except those that you explicitly define to keep by clicking on "Urls to keep" next to checkbox. Cookies are small files that websites place on your computer while surfing internet. A website than can determine if you are a returning visitor and use this information to automaticaly login you or serve you customized web content. This option will delete all Internet Explorer cookies except those that you explicitly define to keep by cliking on "Urls to keep" next to checkbox. Web cache is used to make browsing faster. Cache contains pictures, videos, sounds and other files from websites you visited so on a next visit those files are reused from your disk instead of downloaded from internet. However, quick look at the cache (temporary internet files) can tell a lot about your browsing habbits. Check this box to have IE web cache deleted. Your browser keeps track of all visited websites and pages. 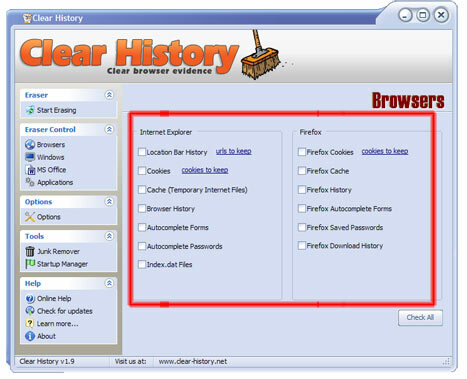 Use this option to delete history of recently visited web sites. Autocomplete is an option when your browser suggest you list of recently typed terms when you start typing, often on various web forms where you are required to enter email address etc. While handy this functionality (if turned on in Windows) means that anyone can see what you have entered into those forms. This option will clear that list. Similar to autocomplete forms (see above), this option will clear all remembered passwords that you previously entered on web. Index.dat are small and hidden files that contains records of your internet activity, visited sites, url-s, documents etc. Use this option to clear content of index.dat files. Cookies are small files that websites place on your computer while surfing internet. A website than can determine if you are a returning visitor and use this information to automaticaly login you or serve you customized web content. This option will delete all Firefox cookies except those that you explicitly define to keep by cliking on "Urls to keep" next to checkbox. Web cache is used to make browsing faster. Cache contains pictures, videos, sounds and other files from websites you visited so on a next visit those files are reused from your disk instead of downloaded from internet. However, quick look at the cache (temporary internet files) can tell a lot about your browsing habbits. Check this box to have Firefox web cache deleted. Your browser keeps track of all visited websites and pages. Use this option to delete history of recently visited web sites (Firefox only). Autocomplete is an option when your browser suggest you list of recently typed terms when you start typing, often on various web forms where you are required to enter email address etc. While handy this functionality (if turned on in Windows) means that anyone can see what you have entered into those forms. This option will clear that list (Firefox only). Similar to autocomplete forms (see above), this option will clear all remembered passwords that you previously entered on web (Firefox only). Firefox keeps history of all downloads. Use this option to clear this history. Delete history of recently accessed files and documents in Windows. Delete history of recently typed "run" commands (Start menu - Run). Delete history of Windows search command. This does not include web browser or thirty party software conducted search. Delete history of Windows "Find Computers" command. When you copy and unpack files or work with various applications temproary files are stored on your system. Those files are useless, they occupy space on your system drive and they could tell about your usage activities. Check this option to delete temporary files. This option will permanently delete the content of recycle bin without posibility to recover deleted files and folders. Clipboard is a reserved memory space where data is temporarely stored when you use copy/paste commands. Windows remembers history of what files were opened and saved from various applications through its default open/save window. Use this option to delete this history. Deletes history from Microsoft Word. Deletes history from Microsoft Excel. Deletes history from Microsoft Access. Deletes history from Microsoft Pover Point. 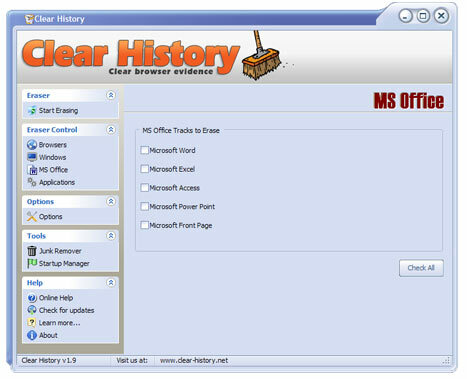 Deletes history from Microsoft Front Page. Deletes history from Win Zip. Deletes history from Win Rar. Deletes history from Windows Media Player. Deletes history from Microsoft Word Pad. Deletes history from Media Player Classic. 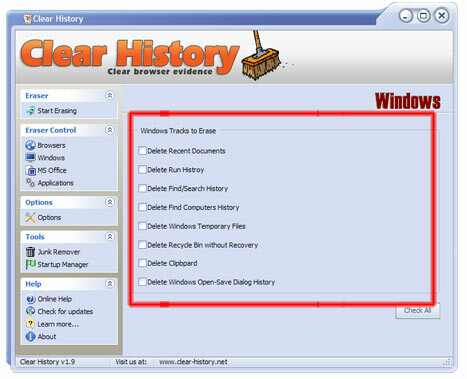 Check this option if you want Clear History to be launched automatically each time Windows start. Prevent forced change of default home page web address in Internet Explorer. Choose shredding algorithm ie. in how many passes files should be overwritten. This options can make shredding more secure but slower to execute. On top of shredding files in multiple passes you can define how meny times shredding algorithm should be employed on files. This option can make shredding more secure but slower to execute. Check this option if you want shredding to be executed automatically each time Windows start. Check this option if you want shredding to be executed automatically each time Windows is shutdown. Check this option if you want shredding to be executed automatically each time web browser is closed. 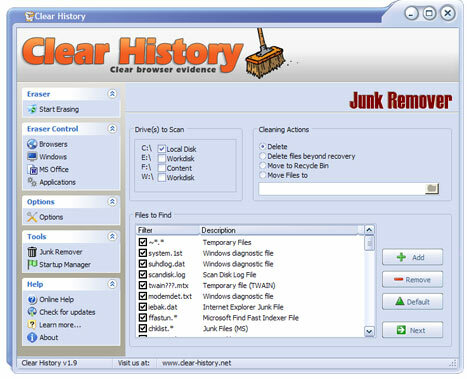 Junk Remover serves to delete various unnecessary "junk" files from your system. With Startup Manager you can control which programs you want to be automatically launched when Windows start.